Truth be told, you’ve never seen happier critters than these three when the trash truck comes. They rush to the door like tiny lunatics, all squabbles pushed aside for a glorious 30 seconds as they watch entranced. Finally, something has been found that can be shared by all, but possessed by none. The excitement is palpable as they stand, eyes glazed and boggled, caught up in the wonder of it all. . . they will remain glued to the door until this beloved green monster passes from sight for another long week. The men themselves are regarded as heroes by these pint-sized enthusiasts, a fact which these dumpers of debris seem to be well aware of . . .sometimes they wave back – And once, the driver actually honked his horn!!! You shoulda been there. It was like meeting a celebrity. Like Christmas morning. Like magic. . . Okay, this is so true ! And what about the street washer truck ! That random spectacular event usually meant getting shoes on everyone to head outside even. Aus was always excited when he was little, now not so much ;)…the girls, never really crazy about it…wonder about Andrew…. awww!!! You’re making me wish our trash truck didn’t come at 4am!!! lol Well, I already wished that, but for a completely different reason. Very cute post, I love it! Hysterical!! Goes to show you that you don’t need extravagance to entertain children. Mine were the same way when the neighbor’s driveway was paved!! I hope you have another girl too!!!! I love it, this is hilarious! I love how you tell it. Makes me want to watch the garbage truck myself next time. Your photo is wonderful, I love how the kids are backlit, like they’re looking into one of those carved-scene Easter eggs all glittery and beautiful within . . . . The sheer wonder of another world, albeit a stinky garbage truck, but fascinating nonetheless. 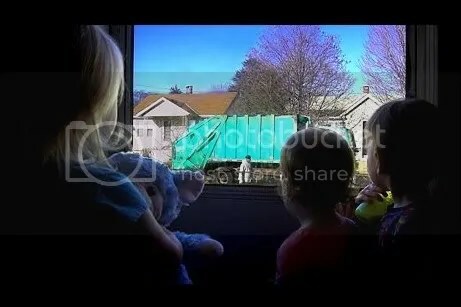 U made me laugh…Aadya listen to the voide of trash truck and will go to Window and say Good morning truck!!! He he he I always laugh to see that!! !